Multiple-choice tests are both tools for assessment and they enhance learning. 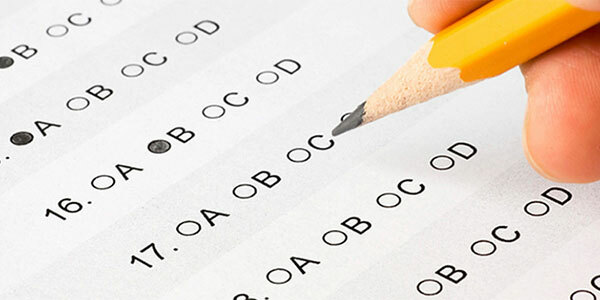 Cognitive psychologists of Washington University, U.S.A. have recently made detailed study on improving the efficacy of multiple-choice tests, whose results are published in the Journal of Applied Research in Memory and Cognition. Create questions with simple formats. Complex formats encourage guessing and less on recalling correct information. Create questions that engage "real world" cognitive processes. Questions that require higher-order thinking will enhance learning and improve future performance. Avoid using "none of the above" as answer choice. When "none-of-the-above" is correct, students may not need to retrieve correct information to answer the question and they are exposed a lot of incorrect information. Avoid using“all of the above”as answer choice. Using "all of the above" exposes students to a lot of correct information, but answers may be more obvious, robbing students of potential learning that comes from recall processing. Use three plausible response options. Question difficulty increases with each answer option offered. Questions that offer too many plausible answers can have a negative effect on both learning and assessment. Make the test challenging, but not too difficult. Create tests that are hard enough to reveal how well students know the material, but easy enough that a majority (80 percent) get a passing grade. Challenge students, but allow them to succeed. Feedback enables test-takers to correct errors and avoid internalizing incorrect information. It also strengthens learning around correct answers that were low-confidence guesses at test time. To maximize both effectiveness and efficiency, it is also best to keep the process of answering multiple-choice items simple -- added complexity often has a negative effect on both learning and assessment, suggests the study.